Washoe Lake and Little Washoe Lakes are located in the heart of scenic Washoe Valley, between Carson City and Reno. Here, visitors will find spectacular views of the majestic Sierra Nevada and the Carson Range. Popular activities in the park include nature study, bird watching, hiking, horseback riding, picnicking, windsurfing, water skiing, catamaran sailing, jet skiing and fishing. A campground, boat launches, group use area, day-use picnic sites and equestrian trailhead are available. A wetlands area with a viewing tower and interpretive displays is a new addition to the park. The park is located 10 miles north of Carson City and 15 miles south of Reno. Take U.S. 395 north to the East Lake Boulevard exit, than drive north on East Lake Boulevard approximately 3.1 miles to the park entrance. From Reno, take 395 south to the East Lake Boulevard intersection, turn left, and drive south on East Lake Boulevard for 7.1 miles to the park entrance. Washoe Lake sits at an elevation of 5,029 feet just below the tree line in open sagebrush country. Being higher than Reno or Carson City, temperatures are typically five to ten degrees below those reported for the cities. Highs in the summer range from 80 to 95 degrees Fahrenheit to with lows between 40 & 50 degrees. Winters bring freezing temperatures at night with day time highs in the 30's to low 40's. Snow is possible but roads and facilities are plowed as needed. 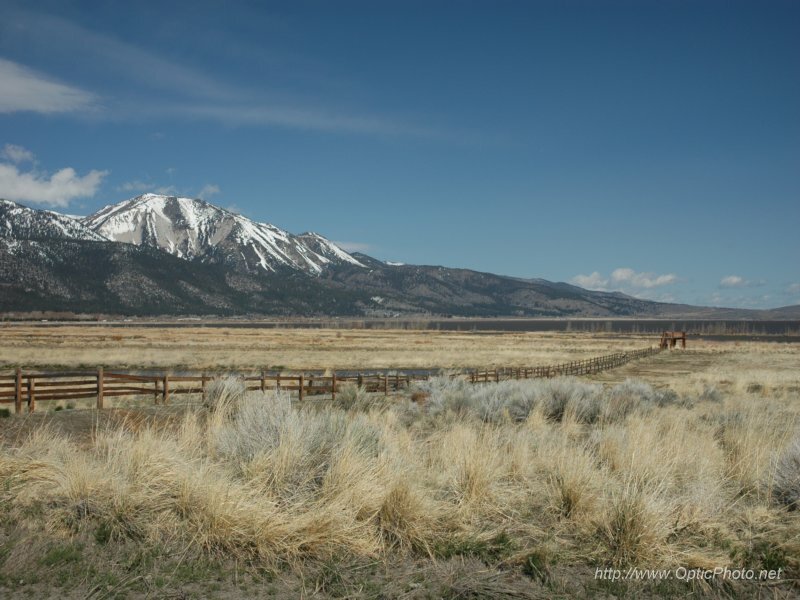 For thousands of years, Washoe Valley and Washoe Lake have provided a home and livelihood to a variety of human cultures in this otherwise hostile land. The name Washoe comes from the original inhabitants, the Washoe Indians, originally spelled Washo. The tribe spent the winters as family groups in the lowlands of the valley, and summers at the "Big Lake," Lake Tahoe. They used the willows and cattails from the wetlands of Washoe Lake to make their elaborate baskets. In 1859, the discovery of silver in the nearby Comstock Lode of Virginia City to the east brought thousands of miners, loggers, and traders to the Valley. In the same year, Mormon settlers established a permanent settlement near Franktown, west of Washoe Lake. The Ophir Mill (which can be seen from Hwy. 395) was built on Washoe Lake's west shore and was reached by an elevated causeway across the then Washoe Marsh. Ruins of the New York Mill can still be found by Little Washoe Lake. Both processed ore from the Comstock. Washoe Valley saw other supply towns such as Washoe City, Ophir, and Lakeview spring up in response to the mining activity. In 1872, the Virginia and Truckee Railroad began service through Washoe Valley, connecting Reno to Carson City. The V&T ran continuously until 1950. By the late 1870's the mining boom was over and the towns around Washoe Lake were all but abandoned. Those who remained behind turned to ranching and farming, gradually displacing the Washo Indians from the Valley. Washoe Lake State Park was established in 1977 to preserve a portion of scenic Washoe Valley for future generations to enjoy, with land and water-based recreation for all. In the wake of the rapidly expanding urbanization of nearby Carson City and Reno, the park is a true treasure to be cherished and protected. Camping is permitted only at the Main Area Campground. 49 sites, each with a table, grill, and fire ring, are open year round and available on a first come first serve basis. Some sites are equipped with shade structures. Two comfort stations with showers are available. Several sites can hold RV's up to 45 feet in length. Sorry, no hookups. A dump station is available. Camping limit is 7 days in a 30-day period. Boat Launching Ramps and Docks can be found in the Main Day Use Area and at North Ramp. Boat trailer parking sites are provided. No direct boating access is available at Little Washoe and use by motorized craft is not recommended. Trails are available throughout the park, for motorized and non-motorized uses. Non-motorized trails accommodate hikers, mountain bikers, and equestrian riders. Motorized trails are limited to the Virginia Range east of the park. Maps are available at the park office and information kiosks throughout the park. Equestrian Areas are found at the Main Area and North Ramp. The Main Area facility includes restrooms and a covered barbeque area with tables, grill, sink, counter space, power, water and lighting. Camping is permitted for both tents and RV's with large parking areas for easy horse trailer access. Area can be reserved for groups up to 200. The North Ramp facility is day use only and provides parking, water, and picnic tables.